It was a game of two halves for Rick Trigg at the GUKPT Blackpool Main Event yesterday. The man from Sheffield was one of the first players to bust out on day 1B but his decision to re-enter looks like being a profitable one after he closed the day in the chip lead on 120,000. 63 players survived the nine levels of play on Friday including defending champion (62,825), Sky Poker pundit Ryan Spittles (49,275), Genting Poker Series winner Albert Sapiano (46,450) and WSOP Main Event finalist Jon Kalmar (30,900). 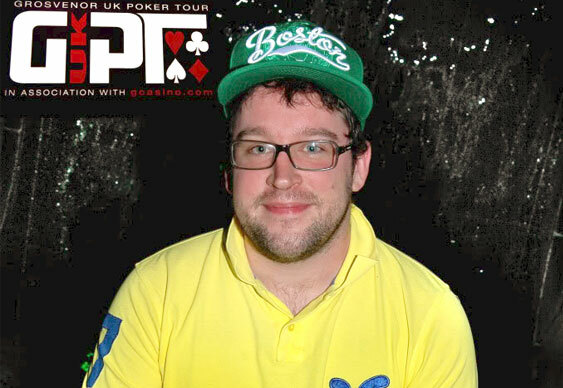 Julian Thew won't be adding to his hat-trick of GUKPT titles though after busting yesterday. Joining 'YoYo' on the rail were the likes of Jeff Kimber, Yucel “Mad Turk” Eminoglu and Macka Hussain. The 155 day 1b entries combined with the 71 from the opening flight means a guarantee busting prize pool of £226,000 with the winner set to trouser £63,000. The action resumes at noon today.